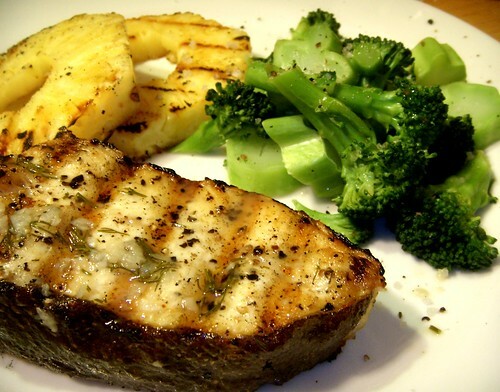 grilled halibut steaks dressed with lemon-dill-garlic butter with grilled pineapple and sea salt dusted steamed broccoli, originally uploaded by aarn! +20th March, 2009+. steamed some broccoli with a drop steamer in a pressure cooker until slightly tender, then placed in a 170-degree oven covered until plating. heated 1T. of butter and a 1/2T. of olive oil, then added a clove of garlic, which had been minced and crushed, and lightly sauteed until the garlic flavor had been dulled a bit. then added the juice from 1/2 lemon, and let cool until safe to the touch, then poured in a bowl over 2T. or so of chopped fresh dill. the dill was allowed to infuse covered in the 170-degree oven until the halibut came off the grill. grilled a nice thick bone-in steak of halibut (on a well-oiled hot grill), which had been cut into two 1/3-lb portions and tossed lightly in olive oil, salt and pepper, until nicely colored and slightly firm (about 7-min/side). plated and brushed the top side with the lemon, butter, garlic, and dill sauce. served with the steamed broccoli, spritzed with a wedge of lemon and lightly dusted with some coarse sea salt, and some slices of pineapple which had been lightly grilled. My husband made this the other night..absolutely fantastic! Love this site, way interesting stuff.